Jóhann Jóhannsson composes a symphonic music which draws more from the present than the past. His works incorporate many unusual, possibly ironic, elements layered in with the familiar sounds and motifs of a classically outfitted string orchestra. His third CD IBM 1410 - A User's Manual (42'52") is a peculiar mixture of beautiful stringed harmonies, romantic building themes, overtly long crescendos and somber resolutions - vaguely tinged throughout by synthesizer rumblings, electronic drones, sparkling chimes and manipulations of recorded sound. The result is a comforting, yet somewhat surreal music. 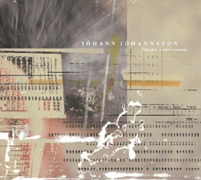 Johannsson's bold gestures and unconventional couplings are sure to confuse devotees of the genres he draws upon - Classical, Ambient, Minimalism, Soundtrack, New Age, Space - and embraced by those who have a more knowing or universal approach to music appreciation.